Spencertown Academy Arts CenterBend the Knotted Oak presents "America The Beautiful"
Sunday, October 18, 2015 Bend the Knotted Oak Chamber Music Concert “America the Beautiful” 2:00pm. $20. Free for under 18. Come and hear the kind of classical music that stirs passions. 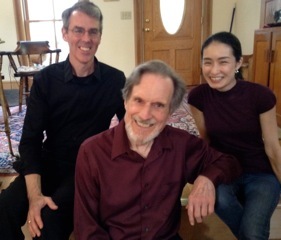 BKO Chamber Music is playing it (Uel Wade on piano, Mitsuko Suzuki on violin, Robert Reed on cello). The composers are all-American, all 20thcentury. They all rebelled against the European way of doing things, against the “progressive” academic dictum that music had to move beyond tonality, whether audiences like it or not.